Pastor Odle is the Senior Pastor at First Baptist Church, having served here since 2011. He is passionate about the Word and sharing the good news of Jesus Christ! Pastor Odle loves the Lord and His people and it can be seen in every part of his ministry. Before coming to Elyria, Pastor Odle served as the Chaplain and Vice President of Enrollment and Student Life at Faith Baptist Bible College and Theological Seminary, his alma mater. 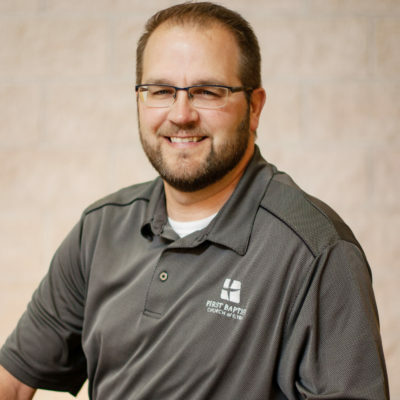 Prior to serving at FBBC&TS he was the Senior Pastor for nine years at Holmes Baptist Church near Clarion, Iowa and the Associate Pastor at Ankeny Baptist Church in Ankeny, Iowa. Pastor Odle is married to his high school sweetheart, Ruth. God has blessed them with four children, ranging in age from 23 to 14. In his free time Pastor Odle unapologetically cheers on his beloved Nebraska Cornhuskers football team (though he is slowly starting to love the Buckeyes!) and enjoys spending time outdoors, especially gardening and hunting. Pastor Odle’s greatest ministry passions are serving the people of First Baptist Church and its surrounding community, and preaching God’s Word in an expository manner with the goal of exalting the Lord and changing lives! Copyright © 2019 First Baptist Church – Elyria OH.